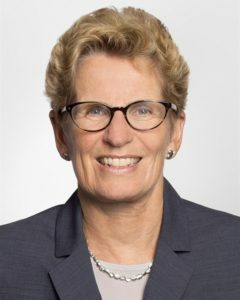 Kathleen Wynne better hope that her threat of a lawsuit fails because if the courts in this province can find that Patrick Brown guilty of defaming the premier over some off hand remarks then the courts must find her friends in Sudbury guilty of bribery. Part of the claim by Wynne and other top Liberals is that when Pat Sorbara and Gerry Lougheed are heard on recordings offering Andrew Olivier jobs, they weren’t really offering him jobs, just discussing opportunities. Here is how The Toronto Star, the unofficial newspaper of the Liberal party, reported the comments Brown made to reporters earlier this week outside of the legislature. “We’ve got a sitting premier sitting in trial and answering questions about allegations of bribery,” Brown, who is a lawyer, told the assembled press throng Tuesday outside the House. “I hope that the premier will give us answers. We’re not getting them, in the Legislature. Maybe when she stands trial,” he continued. Is that Brown trying to defame the premier? The Star has been treating the threat of the lawsuit as bigger news than the premier testifying at a bribery trial. The threat of a lawsuit came moments before Wynne took the stand The Star was all over it. “You have made a statement about the premier of Ontario that is false and defamatory,” wrote lawyer Jack Siegel of Blaney McMurtry LLP. I think Mr. Siegel is overplaying his hand. But let’s assume he isn’t and we have to take Brown’s words the way Wynne and her lawyer frame them. Now let’s use that same framing and look at just part of what Wynne’s friends said while offering Olivier jobs. Gerry Lougheed went first and was upfront that he was coming on behalf of and speaking on behalf of the premier and asked Olivier to consider stepping aside and not running as a Liberal in the Sudbury by-election. The day after Pat Sorbara called and was upfront in putting jobs on the table, she told Olivier to let her know what he wanted. Doesn’t that sound like offering someone a job? Doesn’t that sound like offering a politician a bribe not to run? The Liberals claim it is nothing of the sort but now also want us to believe that Patrick Brown’s much less clear comments, his muddled, off the cuff comments about Wynne testifying are an attempt to defame the premier. In the supposed lawsuit I heard that they were attempting to sue for Libel. How can this be so as Libel is the written version of defamation of character. Slander if this is what they claim is the correct response as the comments were verbal in nature. Brown did not say that Wynne was on trial he merely said off the cuff if she was on trial. No slander here as far as I can tell. This arrogant bunch will do whatever it takes to deflect from the truth of their sickening actions. Wynne’s open & ongoing support for Rule of Law; Law & Order; Peace, Order & Good Government — or whatever — must bring a tear to the eye of every supporter of our Justice system.